It’s the second week of December. The egg nog is spiked. Our Christmas tree has been purchased, trimmed and decorated, and it has actually been (kinda) seasonally chilly here in L.A. the past few days. Having said that, I think the holiday-related posts can officially begin, and I can tell you there is no better way to do so than with this unsanctioned soundtrack to Jim Henson’s Emmet Otter’s Jug-Band Christmas. If you grew up in the 80s then this really needs no further explanation. Welcome to Frogtown Hollow. Nice! It’s not the holiday season without a visit to Frogtown Hollow; one of my all time favorites. Killer soundtrack. Thanks!… as far as I know – never released on vinyl? The only other holiday film (‘Charlie Brown Christmas’ aside) that hits my seasonal bulls-eye is ‘Trading Places’. abfab, AD! i am covering “When the River Meets the Sea” at a gig I am playing in a few weeks. How ironic, just bought the dvd a couple weeks ago for my sisters kids and watched it with them over thanksgiving! AD earns an INCREDIBLE AMOUNT OF STREET CRED with me for posting about my all-time favorite Christmas Special. Ahh the holidays, full of hot coca, cold weather, kids eagerly awaiting santa, and people like me eagerly awaiting the AD end of the year list! Hope that comes out sooner than later! I’ll have to add some stuff to my wish list! Not letting me download from either Safari or Firefox. Fave Xmas thing period. Thank you. You just made my wife’s Christmas! wow. talk about must have xmas music., goin to play this at my xmas party for sure. 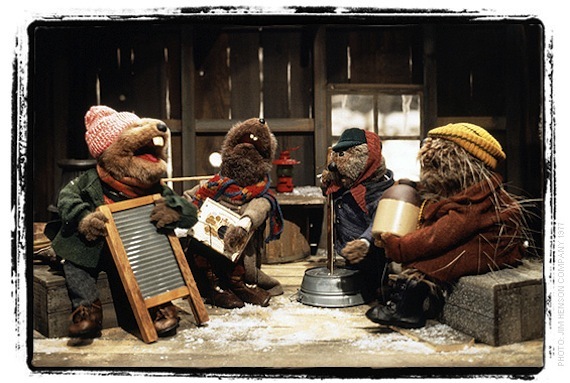 What channel does emmit otter’s jug band christmas play on I haven’t seen it in years? Just watched my VHS copy from about 1997 – Kermit makes an appearance at the beginning, but that’s about it. Still my favorite ever Christmas special. Not sure why the stupid Rankin/Bass stuff gets played all over the place while this one collects dust. Thanks AD for posting the mp3s! I think the Hit Entertainment version of the dvd from 2005 has the Kermit parts. Yancey Woodchuck alone makes this probably the greatest holiday soundtrack ever. Pingback: Gyozamonsta’s 3rd Annual Free Holiday Music Roundup « Feet up on the coffee table, drink in hand. I have been looking for these songs forever but they don’t work!! Can someone email them to me?! It works as of 12/13/2010 – Enjoy All!